Established in late 2015 as the result of the acquisition of The Chubb Corporation (est. 1882) by ACE Limited (est. 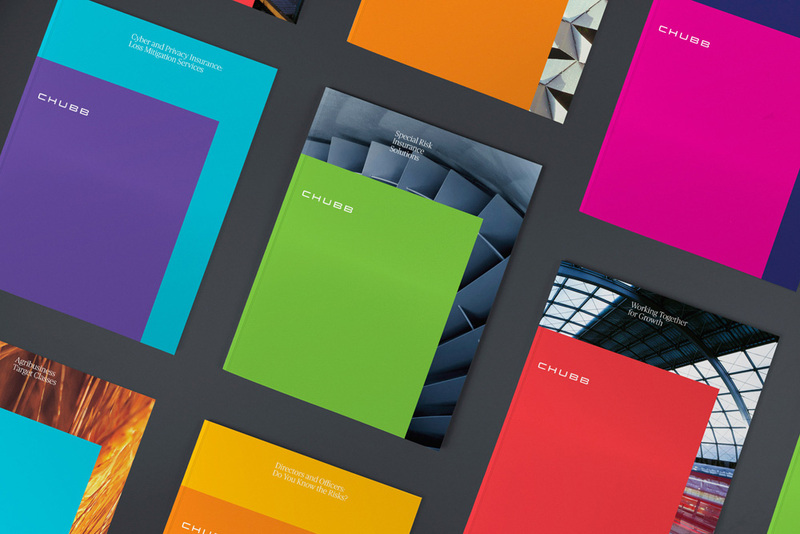 1985), Chubb is a global insurance leader offering both personal and commercial insurance products. Headquartered in Zurich, Chubb has operations in 54 countries, employing 31,000 people, and is the world’s largest publicly-traded property and casualty insurance company. With the merger, Chubb introduced a new identity designed by New York, NY- and San Francisco, CA-based COLLINS, who also helped established the core brand message of “Craftsmanship”. Samples of Chubb’s old look. Very much like what you would expect from an insurance company. Logo with animated field of colors. Logo on all the colors. Both of the old logos were surprisingly “graphic”. Chubb’s odd but bold “C” icon had a Corporate Identity 101 aesthetic that made it look commanding and relatively creative. 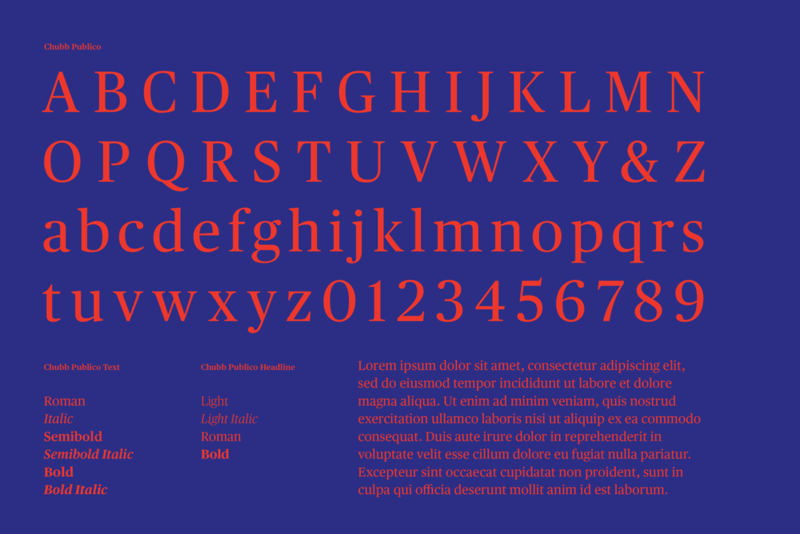 ACE gets some points for energy and daringness if not for clockwise readability. The new logo builds on Chubb’s extended wordmark to create a lovely, simple, and striking wordmark that looks precision-engineered. I guess if there was any detriment to the wordmark being so precise is that it looks like it belongs more as the logo for an engineering or aerospace company than an insurance group, which may not be the fault of the logo but the fault of our combined expectations (and prejudices) of how an insurance group should look — on the flip side it speaks positively to the notion of craftsmanship now running across Chubb. In contrast to yesterday’s Hatch this is a great example of how to expertly do a custom, extended wordmark; I criticized Hatch’s “C” yesterday and look at Chubb’s “C” — that’s hot. As are the “B”s with the relatively aggressive notches that serve both as visual ink traps when the logo is small and as a distinctive element when seen big. Icons. Love the leg in a cast icon. 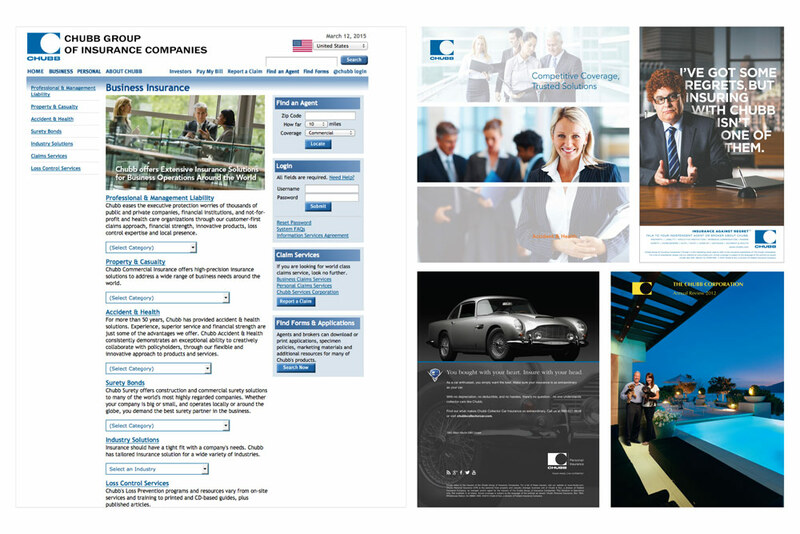 Collins’ work included the design of the new Chubb brand language, including helping set the vision for how the new company will express its values to its customers, clients, and partners. The new program seeks to exemplify the new company’s expertise, strength and leadership across the brand’s range of offerings and services, globally. Ringing the bell at NYSE on January 19, 2016. In application, the bright color palette — I would love to see COLLINS one day use a gloomy or earth-tone palette just to see what happens — serves as a consistent accent across the few executions so far and looks particularly good in the brochures. 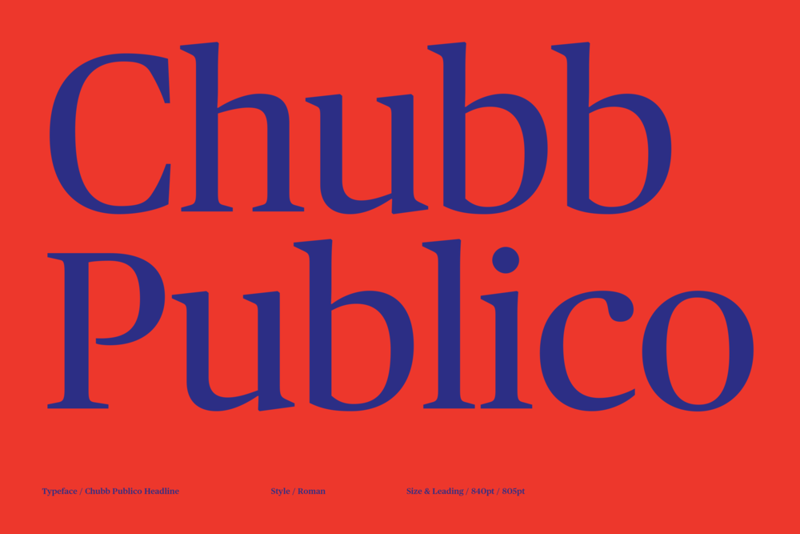 Combining the extended sans serif wordmark with Publico — a type family originally designed for newspaper editorial use — makes for a great combination that bridges the contemporary logo with a more classic aesthetic. The overall craftsmanship messaging can be hard to take without rolling your eyes as we don’t associate insurance policies with craftsmanship like we do with beer or chairs or iPhones but this identity makes the best argument possible in its favor and walks the walk after talking the talk. Established in late 2015 as the result of the acquisition of The Chubb Corporation (est. 1882) by ACE Limited (est. 1985), Chubb is a global insurance leader offering both personal and commercial insurance products. 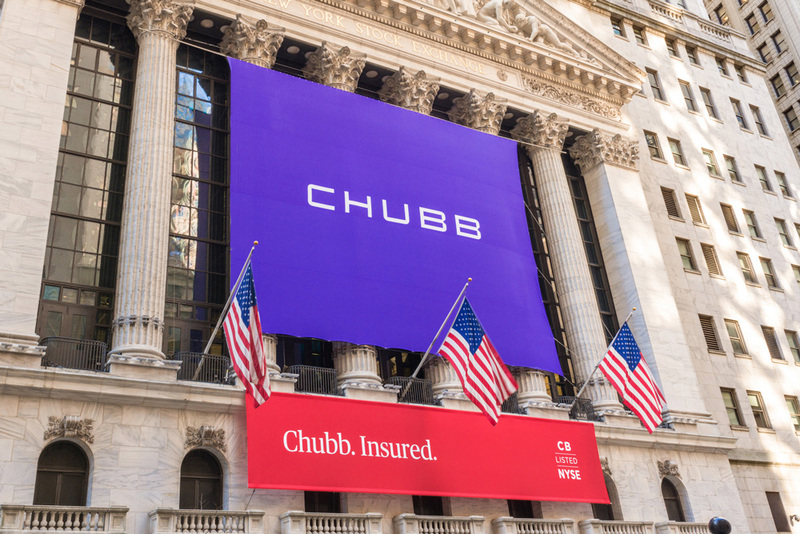 Headquartered in Zurich, Chubb has operations in 54 countries, employing 31,000 people, and is the world's largest publicly-traded property and casualty insurance company. With the merger, Chubb introduced a new identity designed by New York, NY- and San Francisco, CA-based COLLINS, who also helped established the core brand message of \"Craftsmanship\".